Are you remodeling the kitchen? Call Your Project Loan! Shiplap is a set of horizontal or vertical planks that are set parallel to each other. It features opposing rabbet joints that overlap, creating an intriguing and natural-looking texture. It’s a great option for many applications, including walls, stair risers, and other areas. It creates a cozy feel that’s charming and rustic. 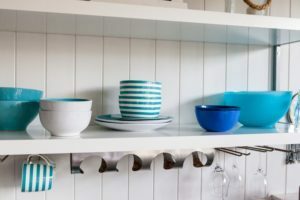 If you’re working on a home remodeling project and you’re interested in incorporating some shiplap in your home, your new kitchen design could be the perfect place. From an architectural point of view, shiplap was originally used in a functional way, as sheathing between a home’s exterior and its framing. Now that more people value it for its looks than its function, shiplap is more often found inside. With that said, a great way to incorporate shiplap into your kitchen design is on the island. If you’re adding a new island in your kitchen remodel, you can use shiplap on the back. It will add some dimension and more visual interest in an area that is usually left plain. You can cover the walls in your kitchen with shiplap to create a fully cohesive look. If you love the texture and dimension of shiplap, covering the walls will really give your kitchen design its own character and style. If you want to create a specific look for each space in your home, the shiplap will make the kitchen stand out. If you have any custom seating in your kitchen, like a nook, using shiplap across the bottom will be a great addition to that area. Use it to frame the space to make it stand out as a designated area for spending time with the family. It will give your kitchen a playful appearance that’s fun and interesting. Most shiplap comes in white, but you can add your own flair by painting it. Choose a color and theme for your kitchen that will help set the mood for the space. Whether you use it on the island or the walls, you can bring even more attention to it with a pop of color. This entry was posted on Friday, January 25th, 2019	at 11:21 am	. You can follow any responses to this entry through the RSS 2.0	feed. Both comments and pings are currently closed.